Nothing special but it was! It was a good weekend at Six Meadow Farm maybe not because we did anything special but because we did not. It was a weekend for chores and horses and family. Friday I got momma to the doctor for the first time in Texas and she was pronounced healthy and doing well except for needing to eat a little more. We can work on that. Then I picked up Jordyn for a sleepover. I don’t often express it, but am so grateful and humbled to be able to share my life with my grandchildren. I look forward to Jo’s visit all week-long. 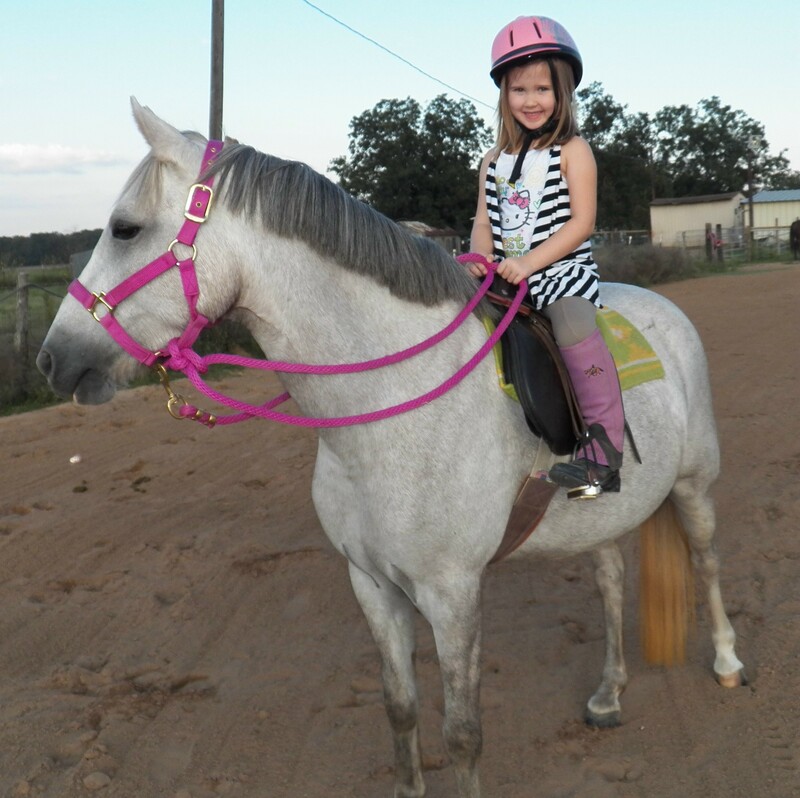 Friday night, Jordyn was determined to ride the new pony Mimi. It had not worked out the week before with schedules so we were going to do it first thing this week. Lauren and I saddled up Mimi, Mickey and Feather with Jordyn knowledgeably helping brush and groom. All the horses were a little fresh and I was skeptical about letting Jo get on Mimi. Remember, this is a young, and for all intents and purposes, unbroken horse. Mimi also has a history of dropping her riders to the ground. But Jordyn was determined. I was determined to hold on to Mimi no matter what. We went to the mounting block and Jo climbed aboard. For a moment, I thought we might be in trouble and then Mimi seemed to make her mind up that she would cooperate with Jordyn. So, off we went. Mimi was a trooper. Jordyn was very proud of herself. It was a little inspiring to watch them (or would be if Jo had any idea how fast Mimi could have put her on the ground). After that, Jo rode (sat on while we walked around) both Mickey and Feather. Big stuff. Mickey and Feather worked well for Lauren. My email pinged as we went in with word from University of California that Mickey does not have the Impressive disease-he is HYPP/NN. Amazing news. I am so grateful that we will not have to fight the HYPP battle. Saturday we went to the Equestrian Center to take a saddle to be checked, take some shots for Snowboy (Dev will give later) and to watch a few rounds of the show. It felt odd not to be able to be there with Mickey. Hopefully, he will be back soon. The high point for Jordyn was to be able to see and then meet part of the family that is related to Harry DeLeyer the owner of Snowman, for whom the book the Eighty Dollar Champion was written. Snowman, The Cinderella Horse, (a children’s book about the same horse) is Jo’s favorite book. She studiously shook hands with young AJ DeLeyer and seemed a little in awe. AJ told us his grandfather would be coming to Houston in January to do a motivational speech. Count the Davis’ in-I would love to meet this man who won the national championship on a horse he bought from the butcher for $80. Later Lauren and I visited Nanny. She was so excited to see us. I just want to go to see her face light up. We rode Mickey and Feather out on the hay road. I don’t want to jinx myself but he did not cough once. We had several good long trots. It was a beautiful evening. Really glad I did not walk through this on my way to feed this morning! This morning we got up to heavy fog with sun starting to peek through. 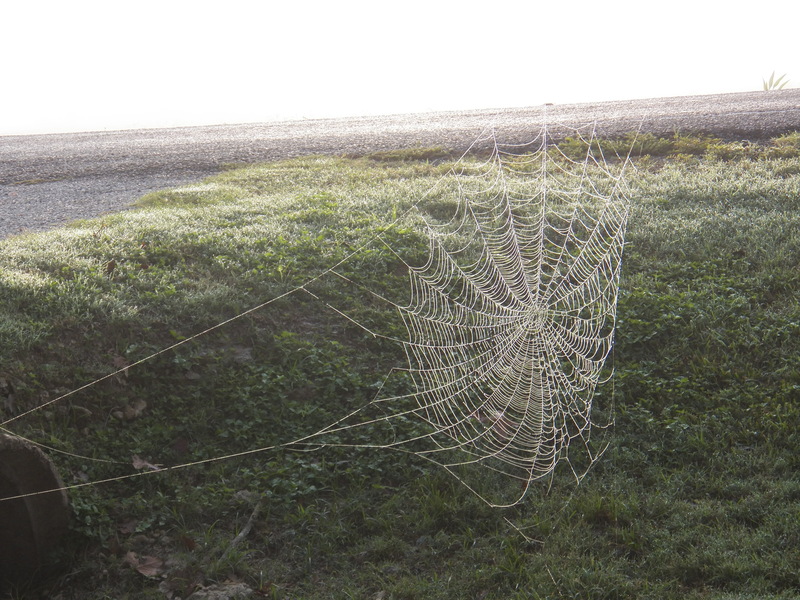 Nature had been busy overnight spinning webs that shone in the morning light. Today, as we started getting the horses ready to ride, everyone was acting goofy. Feather has never done well with tying but today she reared multiple times and was just acting dumb. Mickey and Mimi were not incredibly agreeable either. I rode Feather (who is much easier to ride since all Dev’s and Lauren’s work). We picked up the right lead (her tough one) the first time! Lauren had a good solid ride on Mickey and the coughing was minimal. Bravo! We rounded out the morning with Lauren getting on Mimi and taking her on her first trot. Mimi is doing very well. I went and picked up my mom and she came to watch her Broncos play my Texans. We figured out she had lived over 50 years in Denver so she was cheering on Denver as I cheered for the Texans. Texans won-yeah! Denver needs to knock off the whole trying to kill our quarterback thing. I made an old recipe of my sister’s that mom seemed to really enjoy. It was a nice change to have a good Sunday dinner. Might want to make it our new traditions. So good have her here, in my life. This entry was posted in Family Life, Life on the farm, Losing my mother-the advancement of Alzheimers and tagged alzheimers, horse training, kids and ponies, Texans by Exechorseluver. Bookmark the permalink. We talked about you as I drove her over to my house. She told me you had called and how great it was to hear from you. I am hoping the sameness and routine of her days here will help her keep things straight. Maybe you can get down to visit someday. You are welcome any time!